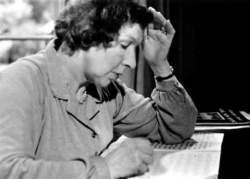 Rosemary Brown, an automatic composer, works on a piece inspired by Chopin. Courtesy Fortean Picture Library. For several decades Rosemary Brown received spiritual messages in the form of music from deceased composers. Brown’s mother was supposed to have been a psychic. Brown claimed that since her childhood she has been in contact with such people as Chopin, Liszt, and Beethoven. Liszt (1811–1886) first came to her when she was seven years old;.she saw him only as a white-haired old man. It wasn’t until ten years later that she saw a picture of Liszt and recognized him as that old man. All of these composers dictated new compositions to Brown, who dutifully copied them down. In 1964, Brown had suffered injuries including broken ribs in an automobile accident. She spent a large part of her recuperation sitting at the piano. She had little formal training and at that time she had not played for at least twelve years, but suddenly she found herself playing. She claims she felt the spirit of Liszt guiding her hands. Liszt went on to introduce to her Bach, Beethoven, Berlioz, Brahms, Chopin, Debussy, Grieg, Monteverdi, Rachmaninov, Schubert, Schumann, and Stravinsky. On April 14, 1970, CBS television’s Sixty Minutes carried a segment on Rosemary Brown. The material that Brown produced impressed a number of notable musicians, including André Previn and Virgil Thomson. Previn stated that it would require someone with a great deal of musical knowledge and technique to fake that kind of music, though he added that he felt the quality of the compositions was far below the usual standards of the attributed composers. Others have acknowledged that the works are in the style of the claimed composers, but say they lack the quality of the masters. Some critics said that what they heard from Brown was simply reworkings of the composers’ known works, but they admitted that it would take a person of considerable musical knowledge and ability to pull off such a feat. Brown did not have that ability. In fact, she had great difficulty playing the compositions she wrote down. As word spread about her mediumship, Brown started to give public performances. She received more than four hundred compositions from the various dead composers. She issued a recording of some of the works in 1970, under the title Rosemary Brown’s Music. She also authored three books: Unfinished Symphonies, Immortals By My Side, and Look Beyond Today. They include titles from some of the most admired and enduring names in music, including Ray Brown, Rosemary Clooney, John Coltrane, Creedence Clearwater Revival, Miles Davis, Ella Fitzgerald, Isaac Hayes, Little Richard, Thelonious Monk, Oscar Peterson, Tito Puente, George Shearing and Mel Torme.